And then today, suddenly, it was unmistakeably fall. The leaves turned overnight, reds and bright yellows and flame orange. The temperature dropped ten degrees. The morning started grey before the autumn sun came flooding through the clouds. And then there was the smell of the apples. A day like today is a good day to turn on the oven. And many more such days are coming. I turned on the oven. I roasted a bunch of carrots. This is an impressive way to treat rainbow carrots, although of course you can use the plain orange variety too. Roasting concentrates the carrots’ sweetness, and if you time it right the tops and tails will crisp up nicely. 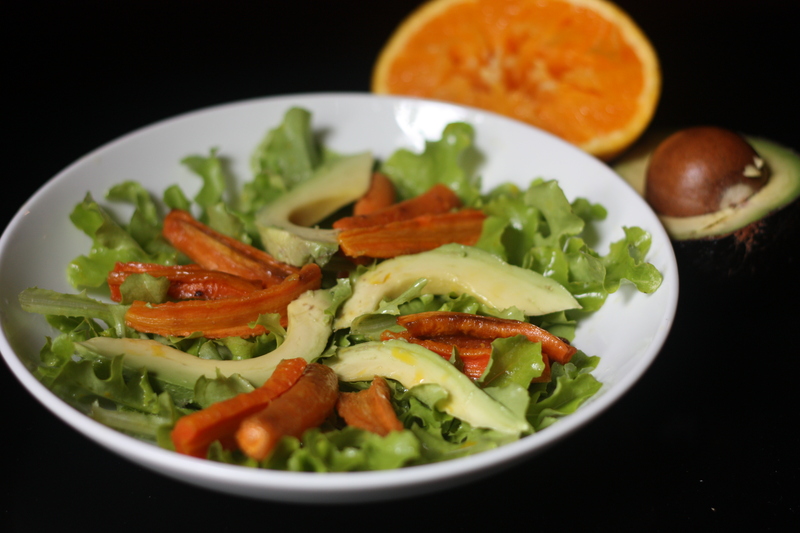 I made these carrots for a Roasted Carrot and Avocado Salad, which I highly recommend. Looking back at that post, I see that I first wrote about this salad after making it for my brother. Tonight I made it for my sister. There must be something about my siblings that makes me want to feed them salad? It’s something good, that’s for sure. The carrots also make a nice side dish all by themselves, of course. 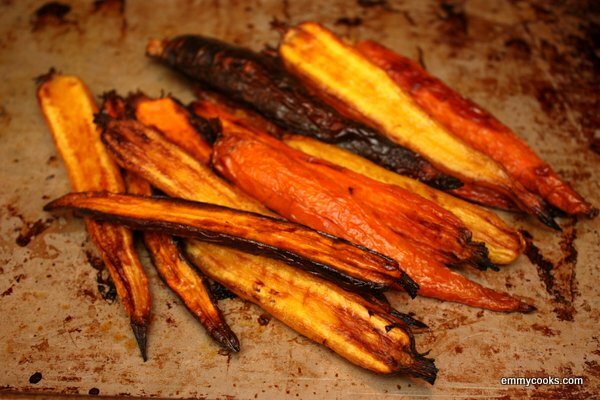 Roasted Carrots: Scrub unpeeled carrots and slice them in half the long way. Toss with olive oil and salt (and a good squeeze of orange, if you like). Roast at 400 degrees for 45-60 minutes, turning occasionally, until caramelized and beginning to crisp at the ends. This entry was posted in Food, Recipes, Salads, Vegan or Would-Be-Just-As-Good-Vegan, Vegetables By Themselves and tagged carrots, CSA recipes, fall recipe, roasting, winter recipe on October 9, 2012 by emmycooks. I love carrots any way I can get them, but roasted are just about my favorite. And I love fall. Combine a beautiful fall day and roasted carrots and it is just about perfect in my book! Thanks for the reminder about roasting carrots. :) Beautiful pictures, too! I swear roasting is magical. Love crispy roasted carrots – this looks like such a beautiful dish! Yes!! It is suddenly fall at our house too. It actually rained last night! :) Roasted carrots (well, all roasted roots) are perhaps the most appropriate fall food. 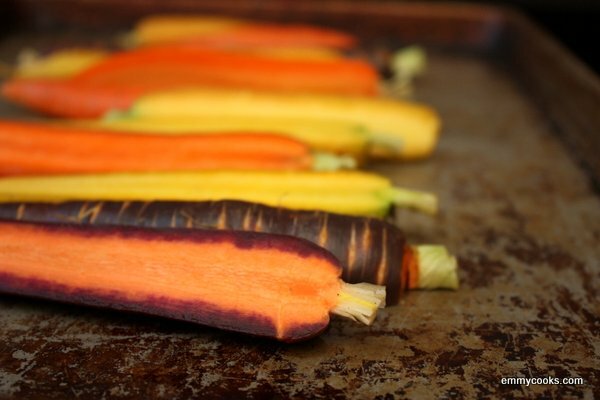 I love roasting vegetables, and roasted carrots are so elegant. They’re perfect when you have people over for dinner, too! It was already autumn where I was, especially in Aspen with amazingly beautiful fall colors. Reblogged this on Food Photography. those look so incredibly amazing! I like braising carrots, but I rarely think of roasting them. cheers.